Mandas Disney Blog: Disney Dreams! at Christmas! Enjoy the ride as we celebrate the Holidays at Disney! This months topic ... What events are you looking forward to or wish you were seeing/attending! 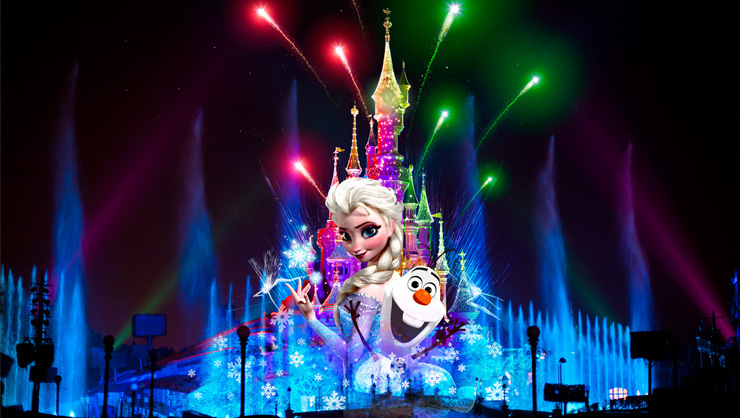 This isn't simply Disney Dreams altered a bit for Christmas ... oh no ... this is a whole new show! Olaf the Snowman from the all new Disney movie Frozen leads guests into a magical show featuring Fantasia, 101 Dalmatians, Bambi and an awesome rendition of the Nutcracker from the characters of Toy Story! I was hoping there would be a video posted in time to show you guys on this loop ... luckily ... there is! Even though the premiere of Disney Dreams at Christmas was only this past Saturday, youtube user Fabien Marliot has managed to share a video of the entire show! So a special thank you to Fabien! Watch with caution ... you may need a blanket to contain the goosebumps! Since I know I wont be visiting Disneyland Paris this winter I snuggled up to watch this 20 minute spectacular with some hot chocolate ...and it. was. brilliant! I loved that I spotted some of my most favourite Disney Christmas scenes, and I heard some of my favourite carols too! This is a must watch for anyone looking for a bit of Disney Christmas spirit! I wish I could see it in real life but thanks to the wonders of the internet I can enjoy this amazing bit of Disney Christmas magic from home. Your next stop on the Magical Blogorail Loop is The Magical Mouse Pad! I love the new shows they are doing. And I would love love love to see one at Disneyland Paris. WOW! That's outstanding. I would love to see it in person! Oh that looks like a beautiful holiday show! I'd love to see it sometime! Thanks for sharing a slice of DLP Christmastime! That was beautiful! I didn't anything about it. I bet it's amazing to see in person. That was beautiful! I didn't know anything about it. I bet it's amazing to see in person. That show is awesome! I sure wish you could make it over to see it in person. Maybe next year?